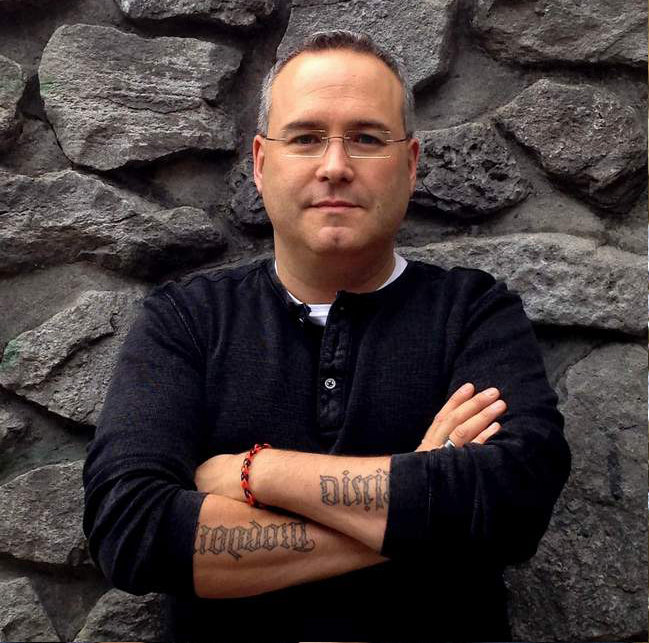 Depending on whom you talk to, Scott Hahn is either a hero or a turncoat. He was raised Presbyterian, and was even on the fast track to be president at a Presbyterian seminary when he began to doubt two protestant mainstays: ‘by scripture alone’ and ‘by faith alone’. So he did what any academically trained person would do, he decided to research and went back to school to do a master’s in Roman Catholic thought, eventually converting to Catholicism. Since then, he has been a prolific writer and speaker on things Catholic, and why the catholic faith is the one true valid faith. This book is part academic treatise and part faith discovery. Hahn states in the introduction that he is writing this book for both his university students, and for the general population - readers of his many popular books on things Catholic. Letter and Spirit is a study of how scripture is central to the mass, and how the eucharistic life is central to the word. It is a study of scripture and liturgy. The book shows a clear progression in the life of the faithful from receiving the written word to the living word in the liturgy. “Liturgy is the very place of our interpretive nearness to the ancients. In our present is our beginning.” p.11 So we need the form and structure of mass to help scripture to be more meaningful to our lives. “From the beginning, the two have been united indissolubly. Scripture is for liturgy, and scripture is about liturgy.” p.34 So, with only one or the other, our experience of faith would be missing. Hahn shows us that the word is God’s plan for us: “In God’s plan of salvation, the Bible leads God’s people to the liturgy. The written text of scripture becomes the living word of God. The Bible’s meaning and purpose are fulfilled in the liturgy – the words of scripture become ‘spirit and life’ … the words of eternal life.” p.100 Through that experience of new life we can live the life to the full promised in Matthew 5:6. Our faith is a part of memory and a path of hope. “The liturgy is the place where tradition lies, where memory lives. This was its purpose from the very beginning, when Jesus commanded his apostles to “Do this in memory of me.’” p.130 Today we are still following that commandment. Daily as the mass is offered, we are living in memory of him. Hahn then shows us that scripture is read in many ways and on many levels. He states: “Reading scripture within the mainstream of tradition means reading it as salvation history – and thus reading it typologically, as it appears in the liturgy and the lectionary.” p.164 But that is just the beginning of the story. We are still developing as the church. “Much work needs to be done. There are books to be written, studies to be undertaken, sermons to be preached, prayers to be raised, and ordinary lives to be lived.” p.172 This book will be a beginning in helping us to explore our faith to a much deeper level. This book is an excellent volume to help a catholic or a Christian grow in a deeper understanding of the centrality of scriptures to faith. Yet, this book will not be accepted by many, because of Hahn’s past, and because he recently announced that he is a member of Opus Dei, and has a book on that topic coming out later this year. As such, though this book has much to offer, the question remains: Will it be received for the treasures within or rejected for the author’s past? Other Reviews of Hahn's Books. Think Rugby is am amazing book for any coach, player or even fan of rugby. It will help you develop as a player or coach. This is a resource no team should be without. One of its primary focuses is to help you learn to think and play as a team, from the coach down to the reserves. Definitely a must read for any Rugby Enthusiast. This is a book to help you on the field and off the field. It will give you training programs for the season and the off season; Weights, Cardio, wind sprints and much much more. This book is clear, informative, encouraging and challenging. This is a resource no rugby player should be without. What do you get when a writer from the Da Ali G Show, Weakest Link, Survivor and The Apprentice takes on the Catholic Church and the question of celibacy for priests? God or the Girl (GOTG). Yet the question of what happened behind the scenes is one that is even more interesting. The show filmed over 5 weeks and the men who aired on TV had been discerning this decision from between three and ten years. It followed 4 men between 21 and 28 years of age. How can 5 weeks of filming capture years of internal debate, praying, and questioning if God has a specific will for one’s life? The original ads for the show said it would follow 6 men on their journey, the IMDB.com site says 5, yet the actual show only followed 4 men. What happened to the other two men? Where did they disappear to? 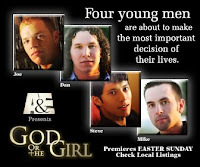 The four men examined in the series are: Joe Adair, 28, a campus counselor at John Carroll University; Dan DeMatte, 21, is a second-year student at Ohio Dominican University; Steve Horvath, 25, who left his job as a high-paid consultant to become a campus missionary at the University of Nebraska in Lincoln; and Mike Lechniak, 24, who must choose between a teaching career and girlfriend Aly and the priesthood. All the hype on TV prior to the airing and the men being interviewed on CNN, by Dianne Sawyer, Larry King, and many, many others created a circus air around the series. The show traveled the world as most reality shows do these days. Filmed mostly in the United States, our men traveled to Germany for World Youth Day, and to Latin America for a missions trip. Even Canada makes a small appearance as Joe goes on a pilgrimage to Niagara Falls, Canada, to Mount Carmel Spiritual Centre. Recently Imprint had the chance to interview Daniel DeMatte. Here’s what he had to say about his experience with the series. Imprint: How long was filming for GOTG? Imprint: How long have you been in this discernment process? Imprint: If someone were approached for a GOTG2 would you recommend it? Daniel: Definitely. It's a great way to evangelize a national audience. Imprint: What was the best experience of GOTG? Daniel: The cross carrying really drew me into the mystery of Christ's passion. It has been a constant reminder and aid in my prayer life. It taught me so much about discernment and God's love and mercy. Imprint: What was the worst part of GOTG? Daniel: The stress of the time commitment. Imprint: With the cameras around all the time, did you find you modified or changed your behavior? If so, how? Was it harder to have personal time with God, or prayer time? Daniel: As Socrates says, "I am the same man always, both in private and in public". No, it didn't change my behavior at all, but it did take away from personal time with God. Sometimes it would be hard to get my prayer in during the filming process. Imprint: If you were I charge of GOTG what would you have done differently? Daniel: Shown more of the broadness of discernment. How it is a call between celibacy and married life, and how you take smaller steps, like first discern should I enter seminary or start a dating relationship. Also, it would have been God or the girl, I would have liked to have shown the beauty of sacramental marriage more. Imprint: Do you pray the rosary daily? If not, how frequently? How important is Mary to your faith? Daniel: I did the deMontfort total consecration to Mary. "I am all thine, all I have is thine, o most loving Jesus, thru thy most loving mother". Mary is very important to me, yet I rotate praying the rosary and the chaplet of divine mercy. Imprint: When you made and carried the cross, could you have chosen lighter wood? Imprint: Looking back from the distance of time, do you regret carrying the cross? Would you ever recommend it to a young man you are working with? Daniel: Not to just any young man...it could be a source of pride for some. But I was very blest by doing it. I would let people know that when they carry a cross like that, God can speak to you for your vocation. See, our life as vocation is linked to the cross. If I am a priest, I am called to lay down my life for my congregation. If I am married, my life is laid down for my wife and kids. When I was carrying the cross, I was thinking more about sacrificing myself for a wife and kids. This is the way my heart desires to lay down my life. This has been very significant in my discernment. Imprint: How many people attend your campus ministry meeting at Fort Zion? Daniel: We have 217 high schoolers in our youth group. We meet at the church, St Agatha’s now. We average about 60 youth per week. We also have monthly events open to the diocese now, at which we average about 350-400 teens. Praise God! Imprint: What would be the single piece of advice you would give to a person who wants to grow in their faith? Daniel: Read 1 John 3:1-5 (See ye what love the Father hath given to us, that children of God we may be called; because of this the world doth not know us, because it did not know Him; beloved, now, children of God are we, and it was not yet manifested what we shall be, and we have known that if he may be manifested, like him we shall be, because we shall see him as he is; and every one who is having this hope on him, doth purify himself, even as he is pure. Every one who is doing the sin, the lawlessness also he doth do, and the sin is the lawlessness, and ye have known that he was manifested that our sins he may take away, and sin is not in him.) Learn who you are, and then respond to this knowledge. Imprint: What books, or authors do you read to nourish your faith? Daniel: Scripture, Therese, deSales, Pope John Paul II, Scott Hahn, St. John of the Cross. This series, which many thought would be a joke, turned out to be a fair and balanced approach. Though it had many short-fallings; first in that it only spanned 5 weeks for a process that takes many years. Second, the variety in background for the 4 men was not very diverse. 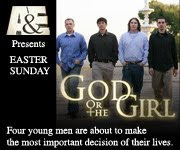 The show shows some of the struggles that men must face in making this life- altering decision. Here at the University of Waterloo we have students at St. Jerome’s who are deciding this as well as seminarians who have made the decision at Resurrection College. If you are Catholic or know Catholics, this series will give you a glimpse into some of the men who consider serving the church, God and mankind in this way. The show had 5 episodes that aired over a number of weeks leading up to Easter weekend this spring. The series is being released on DVD by A&E TV in June 2006. The DVDs have 10 hours of special features and behind the scenes footage. This is a book that I loved until the very end. The end and notes will cause all joy of the story to be lost. This book was long awaited by fans around the world. The first book in this trilogy came out 25 years ago; The Way of the Peaceful Warrior has been an international bestseller since it came out. It was released this month as a movie starring Nick Nolte and Scott Mechlowicz. Both that first book and the sequel Sacred Journey of the Peaceful Warrior are part biographical and part allegory. Millman has, since the beginning, answered questions about what parts of those two books are truth and what parts are story. Now, here in the third book in the series, he blows that whole tradition out of the water. The story is supposed to be the life story of Socrates, Dan’s mentor in the first two books. This is an amazing story of a young man born of mixed blood in Russia. He is part Cossack and part Jewish. He is being raised at a Cossack military school after the death of both of his parents. He later learns about his Jewish blood. During the pogroms against the Jews he leaves the school to go in search of treasure his grandfather has left him. He suffers loss., the loss of a pregnant wife to an old enemy. He vow’s revenge on their grave. He studies under many martial arts masters in order to learn how to seek that revenge. He studies first with a sword master, and then with a master of all of the art’s who tries to teach him to choose life, and be a master of self. For the loss of his wife who was with child. He journeys all over Asia, while studying with these teachers, then in pursuit of revenge that he has studied for years to be ready to exact. Then he eventually to the new world, in search of a long hoped for new life. The story is great. But in this edition, Millman, in the afterward, states that he will not answer any questions about what parts of this story are true and what parts are not. The story leads us to believe that Socrates is Millman’s real-life grandfather estranged from his family at birth. Millman indicates that ‘Socrates’ started journaling the day that he was born and that sometime between Way of the Peaceful Warrior and now he received those journals from Soctares. What is the story? What is the truth? How can he leave us, his readers, hanging like that? Because of this duplicity a reader can call into question all the good that has been taken from Millman’s writings over the years. Addendum 2008 having reread this book and skipping the Harper Collins PS. The story really is amazing and fits in with the original books better than my originally published review. This is a story about a boy, Roy, who has just moved to Florida. His first day at school he gets called ‘Tex’ and the nickname sticks and the harassment begins. Yet life is never as simple as being the new kid in school, trying to hang low and trying to just get by. But Mullet is on a mission. He is trying to save burrowing owls from being wiped out by the Mother Paula’s Pancake House, which is supposed to be building a new restaurant. Mullet uses guerilla tactics: alligators in the port-a-potties, snakes all over the job site, and many, many more. Roy tries to go a different route: checking out building out permits, getting classmates to come and speak and raise their voice at the groundbreaking. Can a few young kids save an endangered bird? Will Mullet, Roy and Beatrice succeed? Pick up the book and read it. There is also a movie coming out this summer that should be a hit with children and adults alike. I was asked by a few readers to separate out my Catholic and Christian book reviews. Therefore I have created a second blog McEvoy’s Musings which is just the Christian book reviews. So if you want just that content you can find it there. If you want the fuller overall reviews of books and movies this is still the blog for you. This is the best show on TV right now. Maybe the best Sci-Fi show ever. If you are a sci-fi fan, this is a must-see show. If not, you should still consider checking this out. Yes, it is in space and yes, it has killer robots, yet even with that, the depth of human drama is comparable to anything on TV today. Last season, the 12 Colonies of Kobol were nearly blown away by the Cylons, machines that resemble humans and the old warrior mechanical types. The humans almost ran out of water and fuel, yet somehow manage to survive. This ragtag group of human refugees is in search of a 13th lost tribe of humans on a planet called Earth. Things this season start out badly, and they only get worse. The second season here picks up right where the first season left off. However, unlike most TV shows, the problems presented in the Season 1 finale are not resolved in the first episode. Some will take the whole first part of the second season to be resolved. As we learned in season 1, there are 12 models of Cylons. The question is: is the Raider (ship) and Warrior, unit 2 of the twelve, or are there 12 models that resemble humans? We do have the introduction of 2 new human-form cylon models (bringing the total to 6/8, leaving 6/4 left to be uncovered), and the reappearance of political activist/terrorist Tom Zarek (Richard Hatch, of the original Battlestar Galactica). A unique feature this season, and one that is a most interesting addition, is a textual representation of how many people are still alive. Each week in the credits, there is a sentence which lists the exact number of survivors, and it changes every week, depending on how many people died (or appeared) the episode before. In comparison to Season 1 it is hard to say which is better. The 13 episodes of Season 1 were all great. In the first half of Season 2, there are also no bad episodes. Battlestar Galactica season 2 has such powerful episodes as " Pegasus" and "Scattered". Yet the best episode of the Season 2.0 DVD is " Valley of Darkness", which in my opinion is sheer brilliance, and possibly the best episode of the series. This is one of the best shows on TV right now, according to many media outlets. "A Breakaway Hit!" -TV Guide and "The Best Show on Television." –Newsday are but two examples of the rave reviews it has received. If you are a sci-fi fan, this is a must-see show. If you aren't a sci-fi fan, you should still consider checking this out. Even though it's in space and has killer robots, it is more human than most other drama shows on TV today. So say we all. Anyway, for those who haven't seen this show, but you like a good character drama, be sure to check out this show on DVD. I believe it's even better on DVD. Much like Babylon 5, there is a single story line, with multiple story arcs all tying into that one line. So there is continuity between each episode...and unlike Star Trek, they don't hit the reset button between each episode or movie. What's damaged on a ship in one episode stays damaged in following episodes, as the first season takes place just over a 3 month period. I recognize that this is a compelling drama that just happens to take place in outer space. It deals with many weighty subjects such as genocide, human flaws, paranoia, depression, and religion. The creators of the original 1970’s Battlestar Galactica included many Mormons. On the Internet there are hundreds of articles looking at the religious imagery, the Mormon end-time theology. The religion themes are just as powerful in this new series and this series has practicing religious (clergy – faithful believers), visions, a drug to induce religious visions, and the president believes she is to fulfill prophecy and save humanity. This is possibly the best Sci-fi series ever! How to find used and out-of-print books! Hunting for used and out-of-print books can be frustrating and discouraging. This is especially true if you need it for that all-important essay. Here is a guide to some of the better resources to help you achieve your end. Your professor has mentioned a book in an offhand way 3 or 4 times, and you want to score some bonus points in your next essay by quoting from her ‘pet’ book. You go to the library, but their copy is listed as missing. You try to interlibrary loan it only to find out no one else has a copy. So you decide to search online for it. Well here’s the short list of sites to check and the order in which you might want to check them. First, if money is not an issue to you, you can check both Chapters and Amazon and see if they have them new. (They also have some used resellers. You might luck out.) Now if you don’t have luck there, you can move on. Abebooks is a website run out of Vancouver; it is a search engine that checks thousands and thousands of online bookstores. This is the premier used retailer online. They have been around for 10 years and give excellent service. It that still fails, there are a few more options. You can try ebay’s book and media section half.com. There are a variety of ways to search: author, title, ISBN. Don’t give up - you may still yet find it. Two academic used and out-of-print search engines are Loome and Alibris. Both specialize in textbooks and arts books. If, after all that, you still cannot find the book, you can check and see if there is an electronic version of it available at Project Gutenberg. There are literally thousands of free ebooks available. The best advice I can give you is to recommend that you be persistent. Recently I found an out-of-print book that has been OOP since the late 50’s. I had been looking for it for years but it was always too expensive. Then it showed up on abebooks for only $4 from a used bookstore in Edmonton. I received it in KW for under $10 with shipping. So don’t give up. Hopefully these tips will help you find those elusive books, and get the bonus marks on that paper.